Vinyasa yoga has a reputation for creativity and innovation. Classes led by different teachers can vary immensely. There are however significant, defining components. Vinyasa is understood to mean linking poses together in a specific way. The breath is crucial in practicing vinyasa and is used to support the linking of movements. As practitioners progress in their practice co-ordinating breath and movement becomes easeful. Practitioners develop a clear intention within their practice and use their breath awareness to practice a moving meditation. If you’re not sure about how to breath in vinyasa, here’s Dylan Ayaloo with a breath tutorial. The 14 classes in this course are all different and are intended to introduce you to variety in vinyasa yoga. 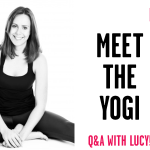 The first four classes are instructional and will help you to develop a greater understanding of vinyasa yoga and help you to get to grips with vinyasa flow. After that the classes will help you to develop your practice and build your understanding. Some of the classes call for blocks. Don’t worry if you don’t own any, use books or tins as a substitute. One of the key components to vinyasa yoga is its spirit of investigation and enquiry. As you practice be aware of your breath and also your body and practice safely. Back-off is something feels painful or is taking you beyond your safe limit. Vinyasa yoga is about developing your self-responsibility and self-awareness alongside your confidence. Move with an intention to be smooth and fluid. After all, this is vinyasa flow not vinyasa jerky. Herein lies the challenge. Let us know how you get on in the movers group or feel free to ask any questions you might have. One of the key factors in vinyasa yoga is the flow element. You’ll have heard of getting into the flow, or into the groove or even into the zone. This is a state of focus and is linked to creativity and ultimately to happiness and a more positive sense of self. Vinyasa yoga creates the perfect conditions to get into a flow state. The Flow State is a term used by psychologists and flow happens when we encounter a challenge that is testing for our skills and capacities but one we can meet even whilst it might take us to our limits. The flow state is recognised by complete concentration whilst your actions and awareness are merged and you lose awareness of yourself but become immersed in your activity which is intrinsically rewarding resulting in a feeling of spontaneous joy and a sense of personal control. Vinyasa yoga can feel challenging but ultimately the greatest challenge is staying present through the practice. You might find that you begin to reduce stress and your practice is helping you to improve your sleep. The follow on from the beginners videos. This is a sequence teaching us how to link some of the postures we have learned in the stepping stones and beginners' series together. With plenty of technique and alignment cues, this yoga class is great for those who want to start to flow - for you to develop your practice. Plenty of forward bends. The second part of your start to a daily flow practice. Ideal for those who have done the Beginners' series. This class breaks down the sun salutes and has a focus on the backbends. You will need 2 blocks. This slow flow yoga class is all about finding your centre in the midst of a storm. You get longer holds, forward folds, twists and longer exhales. Plus a sweet meditation at the end to fully ground you into balance. This flow balances Vata and pitta types - even though you may find it utterly frustrating if you're out of balance. Your chemistry will change for the better after giving this class a go. A little bit of everything in this delicious fluid flow to get you steady and grounded in the morning. Gather qualities of clarity and calm for your day ahead with hip openers, shoulder openers and sun salutations all at a steady, mindful pace. A lovely, calming, floor-based yoga class. Perfect for winding down at the end of the day, or for a very gentle wake up, or for when you're just not feeling your best. This class will have you feeling calmed, restored and gently re-invigorated with a focus on hip and hamstring stretches. The first in a progressing your practice series, great for those who have mastered the basic yoga poses but are looking to start to flow! The first class in this progressing your practice series is a fully rounded class, featuring some of the standing poses you'll have grown familiar with, but with a focus on folding forwards. Forward folds help to release hips and hamstrings - things which those of us who have seated work may struggle with. You will need a blanket, a strap and two blocks. The second class in progressing your practice series, this class is perfect for keeping your spine healthy with twists. 'You're as old as your spine' is the saying and there is no better way to keep your spine healthy than with plenty of twists and gentle movement of the spine. A perfect way to progress your practice and to keep healthy every day. You will need two bricks. The third class in progressing your practice series, this beginners yoga class focuses on backbends. Backbends help to keep the back and shoulders open after days hunched over a computer or smartphone and are essential to keep the back and spine healthy. With some slow flow and twists to counterbalance your backbending class. You will need a blanket, rolled up and two bricks. A lovely introduction to the standing poses or for when you don't feel like a more dynamic practice. This is a slow, nourishing vinyasa without a sun salutation in sight. Highly recommend also for advanced level practitioners who are having a slower day. This sequence is highly restorative, as well as benefiting from being a breakdown of some of the more familiar poses.